Analog Giant: Lollapalooza Day 2. Was able to get to Lolla in time to see Stephen Marley a dude I was very excited about. Some probably thought the set was amazing. I was not one of those. Maybe I was one of the few people that showed up to hear Stephen Marley while everyone else was looking for him to play Legend. And play Legend he did: "Buffalo soldier," "Jammin'" "No Woman No Cry," "Is This Love" were all played to the joyment of casual reggae listeners everywhere. He mixed in some of his original stuff off Mind Control and those tracks were certainly the highlights of what I thought was a dissappointing set. Hell I should have relived 7th grade and gone and seen Silverchair (who people were pleasently suprised). Next up was Rhymefest (now El Che?) and after some early sound trouble he didn't dissapoint. Backed by a live band and hype man he proceeded to rip off some highly charged hip hop and even a new track influenced by Zeppelin's "Dazed and Confused". His energy was unmatched outside of the Daft Punk show. After 'Fest it was over to check out the legendary Roots crew. The highlight of the set being them claiming that "hip hop was dead" then dropping into a 15 minute medley of classic hip hop tracks featruing "Just Friends," "Shimmy Shimmy Ya," "Get By" and others. A bit over the top with some of the solos but again a great hip hop set. Just in time to beat the Metra train back home we caught a bit of the insanely upbeat and positive Regina Spektor set. Here smile and giggly personality instantly winning over fans. It was hard not to see her as a upbeat Fiona Apple. Read more over at the Tribune. Chicago Tribune's Blog on Day 2.
photo by E. Jason Wambsgans of the Chicago Tribune. 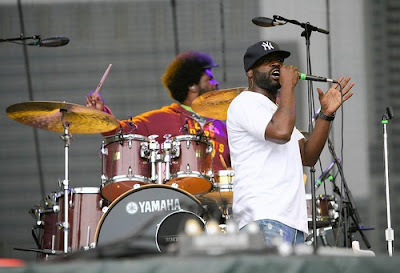 I saw The roots the last week at Nice. One thing to say : It was dope ! The medley was great (award tour, shimmy shimmy ya, method man, get by, just a friend, made u look...), but better without mims, lil john & co lol.